All missionaries are glad to be back at work after more than 10 days in their flats due to Kenya national elections. Thankfully it has been fairly peaceful. Still very sad for those who lost their lives. Even one death is too many. Hopefully right will prevail and corruption will be left in the dust. If Christians would act like Christians and others act also in accordance with their beliefs, there could indeed be peace on earth. It's been a very crazy couple of days with missionaries being released, new missionaries coming, and missionaries being transferred to other areas. We now have 92 missionaries and by September will have 98. That's a lot of missionaries to take care of and President and Sister Msane are doing a great job. Elder Torrie and I are glad to be part of it. We've had several late nights (as in midnight) and then early mornings (as in 6 a.m.) but we're still happy that we were called to this mission. It has been the best thing for us. Now on to some pictures. I may not get all the captions put on tonight since it is late and I still have to get my Primary lesson and the music ready for tomorrow. So I'll post this and edit it later. Just checked the video and I can't get it to play. I'll have LeRon work on it. He's in bed now so I'll ask him tomorrow. . . . Found that the video was too large to post. We found a free program that allows us to snip out parts of the video to shorten it. But it has a watermark across it from time to time. Sorry about that. That's what happens when you get something for free. But it's still fun to hear the missionaries sing their hearts out. By the way, I don't have a lot of pictures of four of the new missionaries -- Elder Wilde, Elder Latta, Elder Konyana, and Elder Bigirindavyi. They had a bit of trouble at the airport and so didn't get in to the mission home until well after midnight Thursday night. The officials didn't want to let Elder Bigirindavyi in. Luckily (or rather blessedly) I had just received his Work Permit that afternoon and I was able to send it to President Msane's phone and after he showed it to the authorities they reluctantly let him in. More problems followed but thankfully, Elder Bigirindavyi is in his area now working as missionaries do. These Elders have served for 2 years and the Sisters for 18 months. We will miss them! Elder Ang'ila, Sister Omo, Sister Njoroge (Judy -- there are two Sister Njoroge's), Sister Maina, and Elder Apuoyo. "Well done, thou good and faithful servants!" Trying to figure out which mission T-shirt fits the best. Hard to decide. Mission accomplished. They've each found a T-shirt and here they are with their mission plaques which have been carved and painted by hand by a former missionary, Elder Musasia. That made it an even nicer farewell gift as all these missionaries served with Elder Musasia. Sister Msane is a lovely, caring, and warm person. She has a great sense of humor. Likes to laugh and so do I so we have a great time together. The missionaries love her a lot and so do we. 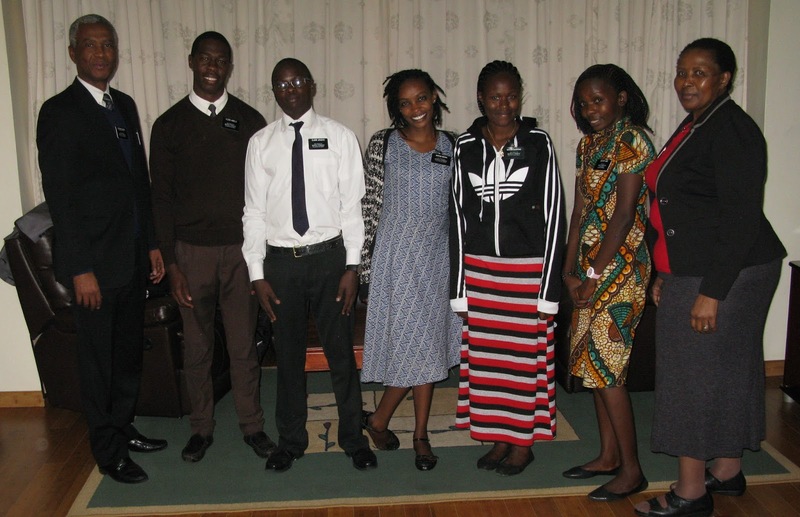 Now here are President and Sister Msane with the missionaries who will go home tomorrow. They are all from Kenya so don't have far to go. All but Elder Apuoyo (in white shirt) will live in Nairobi but they have served in other areas of Kenya. Elder Apuoyo is going home to Kisumu. Elder Hales (on right) has served as Assistant to the President for 11 months. He now has a new assignment in Kilungu where he will be until his release in September. Elder Ellis (on left) will have a new companion and he and his companion will serve as Assistants to the President. Elder Torrie and I are lucky that we get to work closely with the Assistants also. They come into the office regularly so we have gotten to know them well. We will totally miss Elder Hales and his cute laugh! There were lots of missionaries at the mission home on Thursday. Here's Elder Carter, Elder Carlson, and Elder Wilson. Elder Wood is here for transfers. He has served in Kilungu for many months and now he'll be off to Dar Es Salaam in Tanzania. Good thing he's learned so much Swahili because Tanzania is much less English speaking. Elder Limu is here with Elder Wood (blue tie). Elder Mbaya (on left) is a new missionary from Democratic Republic of Congo. He is French speaking. He also speaks his mother tongue plus French plus Swahili (Congolese version anyway) and now he is learning English. Elder Limu is on right. New missionaries Elder Mbaya and Elder Mukengela both from DR Congo. They are both learning English. Pretty hard when you're in a noisy room with everyone speaking English so fast. Reminded me of my brother going to France on his mission many years ago. He probably experienced the same thing these missionaries are experiencing. Elder Mukengela from DR Congo. The church is building a temple in DR Congo and it will be such a blessing for the members there. Elder Hales has been such a great help at these gatherings, not only because he is one of the Assistants, but because he likes to help. He's always doing dishes and cleaning up. Elder Bandi (on left) was a new missionary last transfer. Elder Merritt (on right) is being transferred to Mwanza in Tanzania. He will no longer be coming into Nairobi on a regular basis for MLC and we will really miss him. Elder Musonda and Elder Odhiambo. Elder Torrie and I took Elder Musonda on a couple of excursions (Giraffe Center, Elephant Orphanage) and we took Elder Odhiambo to Nakuru National Park with his companion Elder Noel. Nice to have gotten to know these great Elders. Elder Odhiambo's name is pronounced "oh-thee-awe-mboe." In Swahili a "d" is pronounced like a "th". Elder Musonda is from Zambia and Elder Odhiambo is from Kenya. Elder Merritt and Elder Thompson. We were all singing together and it was great! Elder Thompson loves to sing. He also likes to give himself a very short hair cut! Here are Elder Merritt and Elder Thompson singing away. Elder Hales has always been an instigator for our evening sing-alongs. He loves to sing with all the missionaries and Elder Torrie is more than happy to provide accompaniment. The spirit is strong when the missionaries sing the hymns of zion. Elder Torrie concentrating on his playing (which is unusual because he never has to concentrate. He plays everything by ear and it just flows). Actually I just snapped the picture at an awkward moment. Elder Wood and Elder Limu on Elder Torrie's right. Elder Bandi, Elder Musonda, Elder Odhiambo with Elder Merritt in back. Sister Mathole with new Sister Mbaki (from DR Congo), Elder Gimeyi, new Elder Mbaya (from DR Congo). Sister Mathole will be training new Sister Mbaki. These sisters will be serving in Tanzania. They will be great! Elder Merritt (on left) with Elder Thompson on right. Elder Bandi jumped into the middle and they all squished together so they could see the words in the Primary Children's Songbook. Elder Soita (on left) will be going home next transfer. Will miss him! Next is our fellow Canadian, Elder Wilson, then Elder Ellis with Elder Carlson behind. Elder Gimeyi, Elder Odhiambo, Elder Mbaya. Many (but not all) African missionaries are converts to the church and never had the chance to go through the Primary program (for ages 3-11) so the Primary songs are new to them. You missionary moms should be proud of your sons -- they know how to iron! Elder Wilson and Elder Carlson did great jobs! It's Elder Carlson's turn now to use the iron. Good job! Fun to see Elder Noel on his knees in the kitchen. The cupboard door had fallen off and like the good man he is, he's fixing it! Nice to have a handyman around! Elder Noel agrees with Elder Torrie that building standards here in Kenya are just not up to snuff. Good job, Elder Noel!!! The door works now. Don't anyone use it!! Try pronouncing Elder Bigirindavyi's name. It works if you say it fast with the emphasis on the second last syllable: "beeg-ir-een-dav-ee" Fun to say. Almost as much fun as Elder Mortezazadeh! Love that name. Again, accent is on the second last syllable. Fun!! Be sure to click on the photos to enlarge. Now here are President and Sister Msane with all of the new arrivals and their trainers. President Msane has a great laugh! Back L-R: Elder Thompson with new Elder Bigirindavyi; Elder Musonda with new Elder Latta; Elder Mbaya with trainer Elder Carlson, new Elder Wilde with trainer Elder Gimeyi; Elder Wilson with new Elder Mukengela. On left of the Msanes: Elder Elliott with new Elder Konyana. On right of Msanes: Sister Mathole with new Sister Mbaki. Hmn. . . Do you think these trainers are serious enough to train the new missionaries? I'm sure they are. Good to have fun too. Missionary work is hard work but it's also fun. If not fun, then very satisfying. Elder Wambua, Elder Hales, Elder Soita, Elder Ellis, Elder Mwashi, Elder Noel. Elder Ellis and Elder Mwashi are now the Assistants to the President. Elder Wambua, Elder Hales, and Elder Noel will be going on to new assignments tomorrow. We love these Elders! !